Two Bears Farm and the Three Cubs: Spring Break? Or Not. 1. 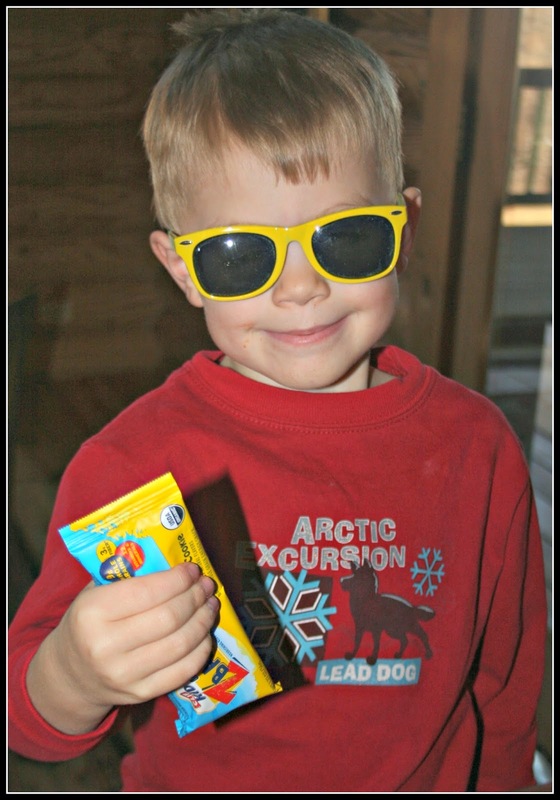 I wasn't obligated to mention this, but Clif Kid sent the boys their new lemon cookie bars to try, along with some fun spring items like sunglasses and a jump rope. The organic bars, as always with their products, were a hit with the boys. 2. Pierce, who already had a shortened Spring Break this year, lost a chunk of it due to all the snow days. Such is life. 3. I've read more books this year already than I read the entirety of 2013. I may need an intervention. 4. At least when you frequent the library, like me, reading books is a hobby that is free. 5. For now, I will be cutting back to blogging 3 days a week. Nothing is wrong. I just want to focus my time on some other things right now, and thought that blogging Monday, Wednesday, and Friday might be helpful in doing so. I love the library. I have been trying to pick up a book instead of turn on the TV. And now one day of spring break is all cloudy and cool, but good for sleeping from what I have seen here this morning. We're big library fans too. :) Happy Easter to you and your family. smashing photo, such a star and so handsome! 3 days a week good for you-and for your reading progress ;-). I know what you means about blogging and cutting back. I have thought of doing that myself!! Libraries are such wonderful places. "Get yourself a card and you've got yourself a key." Three times a week for blogging is "a good thing." That will give you more time to play with your boys, and with Francie, and (of course) your husband. cute pic! happy weekend to you! Happy Easter, Lisa. I too have cut back on blogging... There are just too many other wonderful things to do--so I needed a balance. Hope you have a great Easter --and time with your precious sons. They do grow up SO SO SO fast. enjoy your bloggy time away or change in writing. i need to make some changes myself. i think it is the nice weather. i need some time to garden & such. i see Nancy left the bloggy world, that is a total shocker for me. boy ... having a few health issues has left me out of the loop. big time. oh well ... life goes on. Love that photo, cuteness abounds. I believe you love to read as much as I do! Love the sun glasses! So, I wish you would put a page on your blog which ists the books you've read. I love to read and started a book club here at our local library. Reid looks very cool! Sorry Pierce lost his days. Our county had to extend the days to make up for the snow days. You need no intervention. In my opinion, you can't read too much. I hope the new blogging schedule will give you the time you need. I want to start a blog on my editing site--probably just once a week. Good for you for cutting back. I've been housebound, and my hospice clients keep cancelling ! It's been too cold too garden. What or who makes those lemon bars? Well I sincerely hope you have a blessed Easter. Rats! I always count on you and the boys each day to cheer me up. But at least you are still blogging. My best friend eats the Kids Cliff by the box and loves them. They came out with mint chip bars around Christmas time and were awesome, but are unfindabe now. We love going to the library. Adorable photo, btw. Sometimes, we need to cut back from some things to make room for others! I really need to get back into reading. I used to read several books a week, but I crash as soon as I climb into bed at night! I understand the need to cut back on blogging. There isn't enough time to do everything these days! je kan maar een ding tegelijk doen. I bet they'll love those Cliff Lemon Cookie Bars! Yummy! I understand about needing the reading intervention. I'm also addicted. Having a husband that works in the publishing industry I don't need to frequent the library very much - but only because we now have a massive one at home! I understand the need to cut back some. Three days a week was what I did last year. This year I am doing week days only. Blogging can really take over is you let it. Hope your new schedule works out. I don't read nearly as much now that I'm blogging regularly. I think the eyes can only take so much! Loving the shades ~ very cute ! how cute! we lost good friday from our break but still have all of next week. have a happy easter! I'm sorry you won't be on line as much, but with Spring here I can certainly understand. I'll look forward to your posts when you have a chance to get on the computer. Cute sunglasses! I just love, love, love the library. Looks like you are planning a busy summer. I haven't been reading much at all. I would read a lot more if I would stay off of this computer. I definitely get the need to cut back on the blogging. Try it for a while...but don't stop all together! We'd miss your posts! It would have been nice if they'd done what Rke City did and add an extra few minutes to each day to keep the spring break. Congrats on your #3. I definitely can not say the same--but the year is not over yet. I went to a 3 day schedule years ago, and it still is a challenge. Enjoy your Monday Lisa. Enjoy your mini break! If you read anything recommendable, please let me know, I'm just re-reading old favorites right now and looking for a new series to get hooked on to. I have been reading more too. There must be something in the air. I love the yellow sunglasses!